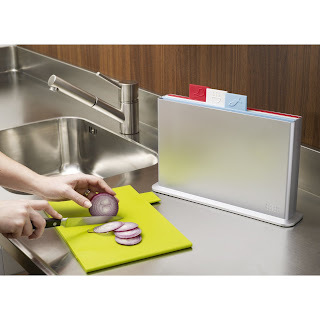 Joseph Joseph’s Index Chopping Boards makes food safety in the kitchen a snap. The cutting board’s categorization system offers 4 color coded boards to distinguish at a glance which board is intended for which use: red for raw meat, blue for seafood, green for veggies and white for cooked foods. Maria Lafreniere posted: I like that idea.....especially when chopping veggies and raw chicken for the same meal! I wash the one board but always second guess! Elizabeth Holland Sisson posted: they're still touching each other in the holder right? So whats the point? Samantha Brown posted: Waste of money in my opinion. If you wash a cutting board properly there will be no cross contamination with foods. James Bohan posted: WASTE. When you put them away they are all back to back. Sacha Chilton posted: That's what they do at restaurants so they don't cross-contaminate. I think its a good idea. Kendal Zeisloft posted: Probably expensive, but a good space saver and organizer. I like the idea. Sacha Chilton posted: I wouldn't store them together but its a great idea. Renae Jennings Sutley posted: I avoid using plastic cutting boards. When I work with meat, I use paper plates so that I don't contaminate anything. Shannon Candy posted: I'd buy it for sure. Tabby Hatton posted: It's a good concept. But to me, the boards aren't big enough. Now, the people saying that it's a waste because they're still touching each other in the holder........ they don't get dirty until you take them out to use them. If you wash them and put them back in together, there's no difference, they're not cross contaminating if they're already CLEAN. Savannah 'Weibling' Kelb posted: I'd prefer them in glass..... it's not porous like plastic... but other than that, awesome idea! Deanna L. Rilling posted: They might be touching when you put them away, but it's back to front, not cutting surface touching cutting surface. Nichoel Johnson posted: I actually have this and they do not touch. Each board gets its own slot and is separated from the others by about 1/4 of an inch. It really is handy if you are cutting up several things for a meal. Elissa Lucas posted: Cut the veggies first. Then the meat. No big deal. Jessica Willis posted: Well if you wash a cutting board the fact that its touching shouldn't matter however the fact that washing it properly coupled with the fact that they're touching anyway eludes to the fact that one properly washed and sanitized cutting board will do. Teresa Riddle posted: Great for restaurants and catering, but for home use, I just wash my cutting boards by hand in the hottest water, and run it through the dishwasher, and I have never cross-contaminated my family with my food prep/cooking. I also do a lot of handwashing. Elizabeth Holland Sisson posted: The color coding is great but I agree they are too small, proper sanitizing is key to prevent cross-contamination...I always clean mine with bleach and run through the dishwasher with the heated dry... just to be safe! Jennifer Theunissen posted: I LOVE this idea and do already have different colored boards for different things. My problem with this is that if they are worried about cross contamination storing the boards all together like this will NOT help stop it without proper washing techniques anyway so for me I like the way it looks and would definitely buy it but it wouldn't be for health reasons. Jodie O'Brien posted: I love how they are stored, it looks neat and tidy. I wouldn't worry about cross contamination if they are cleaned properly. I do think they are to small as well. Carol Brown posted: Waste ... how did we all make it to our ages without all these things? Frandy Labrador posted: Waste! If you want to keep them separate just buy boards that look different (color or shape) label them or use your memory (green for veggies, red for red meat, white for chicken, yellow for fruit, etc-get as extreme as boards you can afford) store them standing on a dish rack inside your cabinets. Lana Rauch Brandon posted: Looks great. In today's economy this is more than a waste. Kristin Henriksen Larkin posted: Waste of money. They can cross contaminate each other the way they are stored. Also if someone in the family put them away wet, that would be bacteria heaven in the enclosed container. I have kiddos that might not dry them completely. Julie Hibbard Kipp posted: Waste of time. If you wash them properly, then you don't need to worry about cross contamination. So what if they touch.. you won't be storing them dirty.